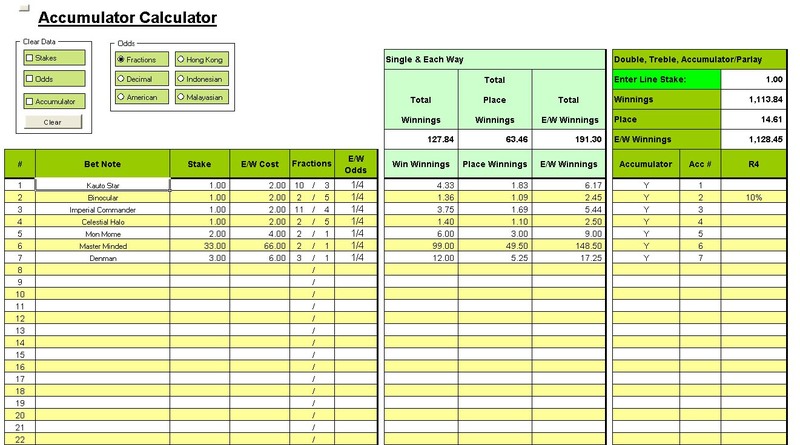 Accumulator/Parlay Betting Odds Calculator spreadsheets for Horse Racing, Football etc singles, doubles, trebles, accumulators. The Spreadsheets Direct Accumulator/Parlay Odds Calculator allows you to easily calculate potential sports bet winnings. The file allows you enter upto 40 odds in either UK(fractions), European(decimals), American, Hong Kong, Indonesian & Malaysian format. Ideal for Doubles, Trebles & Folds upto max 40 bets, the accumulator part will allow you to quickly add/remove odds to the accumulator calculation without having to re-type all the odds again. The winnings are automatically calculated in seconds.